Our in-stock standard double pitch sprockets are manufactured out of SAE-1045 case hardened steel with extra-hardened teeth and coated with black oxide. These sprockets are extremely durable, high-strength, and manufactured to high precision tolerances. Stock double pitch sprockets include standard roller and carrier roller style, single duty sprockets are made to order and typically take anywhere from a few business days to a few weeks to manufacture based upon our factory loads and sprocket specifics. Standard roller type sprockets are the same outside diameter and width as the single-pitch equivalent just with a different tooth profile to allow proper seating of the chain. On even tooth-counts, these sprockets only engage with the chain on every other tooth because there are two teeth per pitch. On odd tooth counts, any given tooth is engaged only on every other revolution which of course increases the sprocket life. Carrier roller type double pitch sprockets are cut with space cutters to allow the carrier roller to properly seat and engage with each tooth. These sprockets will have the same diameter as the ANSI single-pitch equivalent. Single duty sprockets are manufactured to where every tooth gets engaged evenly on each revolution. This sprocket type has become obsolete in most applications but is still available. When using double pitch roller chain it is highly recommended if not required to use a double pitch sprocket. This is because double pitch sprockets are manufactured with a special tooth profile that allows for the roller to properly seat and engage with the teeth of the sprocket. The above photo on the left is the standard tooth profile and the photo on the right is the special double pitch sprocket profile. As you can see above, the double pitch sprockets tooth profile is slightly deeper and cut differently to fully accept the double pitch chain roller. If using a standard sprocket, failure to engage will result in chain jumping as well as excessive wear. Something important to note is that with chain sizes C2040, C2050, C2060, C2060H, C2080H, C2100H, C2120H, and C2160H when the tooth count is 31 or more you can use a standard roller chain sprocket. 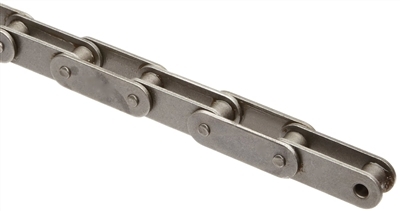 This rule does not apply to carrier roller style chains which where the roller diameter exceeds the sidebar height, these chain sizes include C2042, C2052, C2062, C2062H, C2082H, C2102H, C2122H, and C2162H. Below is a chart of all of the standard C2040 double pitch roller chain sprockets. We also stock a full line of high quality C2040 roller chain. Each part number is a clickable link to the direct product page. Below is a chart of all of the standard C2042 double pitch roller chain sprockets. We also stock a full line of high quality C2042 roller chain. Each part number is a clickable link to the direct product page. Below is a chart of all of the standard C2050 double pitch roller chain sprockets. We also stock a full line of high quality C2050 roller chain. Each part number is a clickable link to the direct product page. Below is a chart of all of the standard C2052 double pitch roller chain sprockets. We also stock a full line of high quality C2052 roller chain. Each part number is a clickable link to the direct product page. Below is a chart of all of the standard C2060H double pitch roller chain sprockets. We also stock a full line of high quality C2060H roller chain. Each part number is a clickable link to the direct product page. 14 3.740" 3/4" 1-9/16" 1-1/4"
Below is a chart of all of the standard C2062H double pitch roller chain sprockets. We also stock a full line of high quality C2062H roller chain. Each part number is a clickable link to the direct product page. Below is a chart of all of the standard C2080H double pitch roller chain sprockets. We also stock a full line of high quality C2080H roller chain. Each part number is a clickable link to the direct product page. Below is a chart of all of the standard C2082H double pitch roller chain sprockets. We also stock a full line of high quality C2082H roller chain. Each part number is a clickable link to the direct product page.